Seth Godin is one of the top marketing minds in modern history. 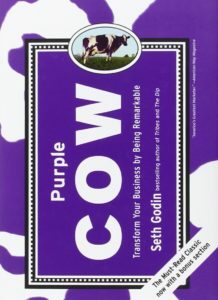 “Purple Cow” was the top selling marketing book of the DECADE. What does “Purple Cow” have to do with recruiting? The book opens with a story of Godin driving through the countryside of France when he noticed a the most beautiful cows. Then he saw more. And more. Hundreds of cows. Thousands of cows. And when you’ve seen thousands of cows they all begin to blend together. None of them stand out. What could make a cow stand out? A “Purple Cow” would surely stand out! A “Purple Cow” would be remarkable! His story of cows reminds me of seeing prospect after prospect after prospect. At first they look interesting. Then after seeing 100 or 500 or 5,000 prospects they all begin to blend together. None stand out. None are remarkable. If you are in the Top 10% in the country, then that does make you remarkable. But, otherwise, you begin to look like everyone else. What can you do to make yourself remarkable? Can you have similar physical skills yet become remarkable with other things to have a positive impact on your recruiting process? I can help you with all of that. The Playbook is actually specifically designed to teach you these skills! In the video I mentioned my friend Joe Ferraro. Be sure to give him a follow at @ferraroonair. Follow Seth Godin at @ThisIsSethsBlog.